Hine Rare VSOP is a blend of eaux-de-vie coming exclusively from the Grande and Petite Champagne with about 60% of the blend being Grande Champagne. The youngest eaux-de-vie in Hine Rare VSOP is about 6 years old but some reach up to 12 years, the average being around 8 years. On the nose, Hine Rare VSOP reveals fruity and floral aromas with hints of honey and jasmin. 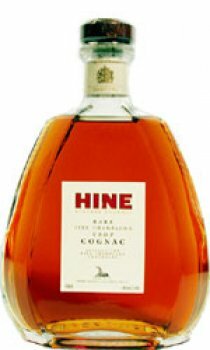 On the palate, it shows great smoothness with the traditional finesse of all Cognac blended by Thomas Hine. I think this Champagne Cognac is quality - for the price you pay I recommend it as a Sunday after Dinner drink with a Humble Cigar such as a Hamlet or for the more extravagant - a King Edward - really nice to adourn any table for a small after dinner drink - real quality. I think this Champagne Cognac is quality-for the price you pay I recommend it as a Sunday after Dinner drink with a Humble Cigar such as a Hamlet or for the more extravagent-a King Edward-really nice to adourn any table for a small after dinner drink-real quality. Being new to drinking brandy/cognac, I am on a voyage of discovery,my fantastic voyage as I call it, starting with basic mouthwash and going froward in quality, although not an expert by any means. I now know what I like,and this brandy is wonderful. An aromatic nose, smooth to the palate and a warm afterglow, it really comes close to XO. Great value for money and does not disappoint. This is my favourite VSOP. It is amazing how smooth it is for a VSOP in fact I would say that it is unfair that it is only labelled a VSOP as it is a bridging gap between VSOP and XO. If you can't stretch to an XO buy this bottle of brandy - if you don't like it post it to me! The VSOP's from the major Cognac houses tend to be of an acceptable quality (unlike your typical VS, which is suitable only for mixing), but nowhere near as impressive as the XO's. Not so for Hine's offering, which does not give the impression of being "whatever we have left over that's not good enough for our expensive blends". The Rare is a fairly heavy, full bodied Cognac, with the floral notes being for decoration rather than substance. Nonetheless, it is extremely smooth with a long aftertaste and has little to no bite to it -- in this respect, it is more pleasing even than Hine's older and more expensive offerings.